THE HALIFAX DEPOT – 1877 – 2015. When it was first announced in 1873 that the ‘Dukes’ Depot was to be moved to Halifax, objections from the local population were numerous and vociferous. Soldiers in the 19th century were regarded as rough, given to brawling in the local taverns and a danger to the local women. A petition, signed by 4,664 residents and supported by the Borough Council, was presented to Edward Cardwell, the then Secretary of State for War. 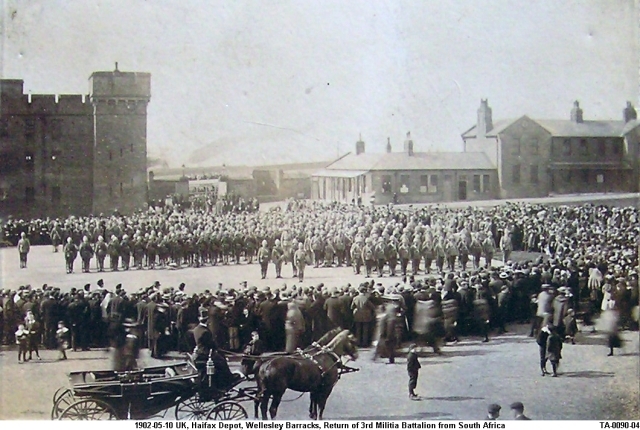 It stated clearly that the “selection of Halifax as a military centre is contrary to the wishes of the inhabitants and such centres should not be established in prosperous industrial districts, in as much as they offer strong inducements to irregularity and neglect of work and tend generally to demoralisation and immorality.” However, the barracks were part of a national modernisation plan and there was much local support as well led by Lord Ackroyd (who built Bankfield House now the home of our museum) and all opposition was waved aside. The barracks was built on land donated by Charles Musgrave on 20th March, 1874. Construction started in March, 1875, by J & W Beanland of Bradford, consisting of 16 buildings, including an Officers’ Mess, two soldiers accommodation blocks, a secure keep and a Guardroom. On 29th August, 1877, a Depot Company from the 33rd (or Duke of Wellington’s) Regiment and another from the 76th Regiment of Foot moved into the Depot. They were joined by the 6th West Yorkshire Militia in October of the same year. In May 1881, as part of the Childers reforms, the 76th Regiment was amalgamated with the 33rd, as it’s second Battalion, taking on the 33rd’s 1854 ‘Duke of Wellington’s Regiment’ Colours, whilst retaining their Honorary Colours, awarded in 1803. The Regiment was briefly titled ‘The Halifax Regiment,’ a testament to the close relationship that had been fostered with the local community by then. It was renamed the Duke of Wellington’s (West Riding Regiment) on 1st July, 1881. A serious fire in the roof of the Officers’ Mess in 1936 prompted a rebuilding programme costing £40,000; and much modernisation was then carried out. Previously there had been no electricity or showers and the new facilities were much appreciated by the officers and soldiers. 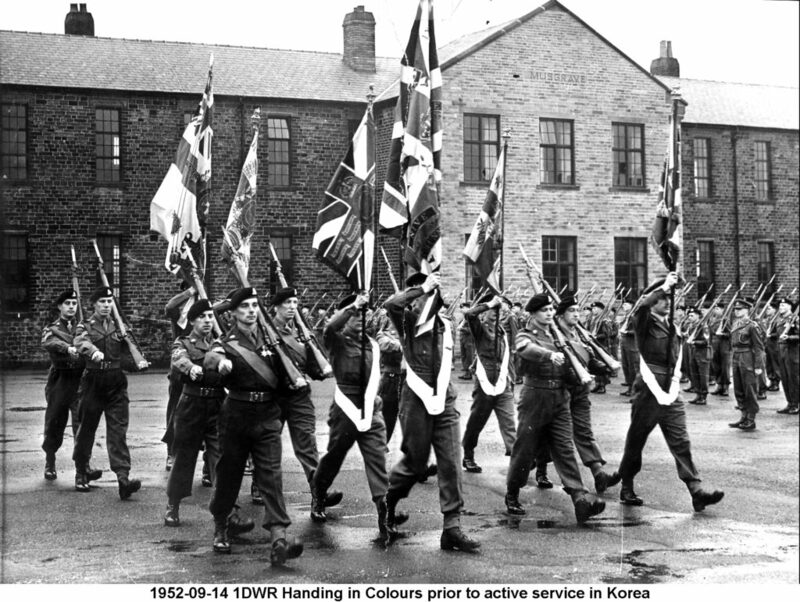 On 7th August, 1959, the Depot was vacated (the last training intake being on 2nd February 1959) and the site sold to Halifax Council on 21st September, 1963, with two of the original buildings retained for use by the Regimental Headquarters. A plan for a new school on the site was announced on 15th September, 2000, and Halifax North High School opened on 5th July, 2005. On 6th June, 2006, the Duke of Wellington’s Regiment was amalgamated into the Yorkshire Regiment and RHQ DWR became Area Headquarters Halifax, becoming AHQ South, The Yorkshire Regiment, on reorganisation of the Regimental Headquarters in October, 2013. AHQ South moved to Huddersfield in December, 2013 and the office was finally closed on the move of the DWR Association Office and the Regimental Archives to Bankfield Museum in December, 2015. From 1883 the local volunteer battalion was officially associated with the Duke of Wellington’s Regiment and the title was changed to the 2nd Volunteer Battalion (Duke of Wellington’s Regiment) West Riding Regiment. The Battalion recruiting area then extended from Mirfield, through Huddersfield and the Colne and Holme Valleys, taking in Holmfirth and Meltham, then crossed the Pennines between Marsden and Diggle to Mossley. 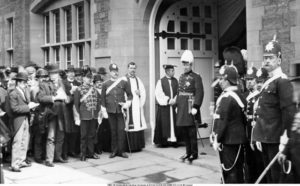 In 1899 the Foundation Stone of the new Drill Hall at St Paul’s Street was laid by Field Marshal Lord Roberts of Kandahar VC KP GCB GCSL GCIE on 4 May 1899. The money had been raised by holding a Military Bazaar and by public subscriptions. 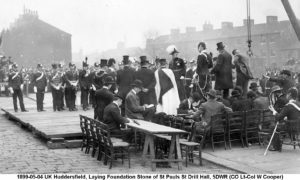 Later a board of Trustees was formed to look after the Drill Hall on behalf of the Volunteers and the citizens of Huddersfield. The Drill Hall was completed in 1901 at the same time that some of the Volunteers from the Battalion were serving alongside the 1st Battalion of the Regiment in South Africa. 1908 The Territorial Force Scheme came into being and the district was divided, the bulk of the old 2nd Volunteer Battalion became the 5th Battalion Duke of Wellington’s (West Riding) Regiment TF, with Companies at Huddersfield, Holmfirth, Mirfield, and Kirkburton with a Detachment at Meltham. A new unit, the 7th Battalion Duke of Wellington’s (West Riding) Regiment, took over the Colne Valley and Mossley Companies and had a recruiting area from Milnsbridge to Mossley. At the outbreak of war in 1914, the 5th Battalion was ordered to duplicate itself and raise a second battalion, these were named the 1/5th and 2/5th Battalions. The 1/5th, in 49th (West Riding) Division, set off for war in April, 1915, the 2/5th following as part of 62nd (Pelican) Division in January, 1917. The victorious troops returned home in 1918, but had left many of their comrades lying in the fields of France and Flanders, Gallipoli and other theatres of the World War. In 1924 the carved wooden 5th Battalion War Memorial at the Drill Hall was unveiled by Field Marshal Lord Plumer GCB GCMG GCVO GBE on 30 August, 1924. 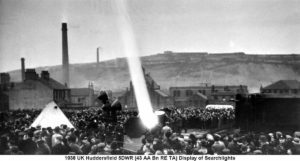 In 1936 the resident Battalion was converted to Searchlights and became the 43rd (5th Duke of Wellington’s) AA Battalion Royal Engineers (TA). The Battalion was permitted to keep the DWR cap badge and buttons and carry the Colours on purely domestic parades. 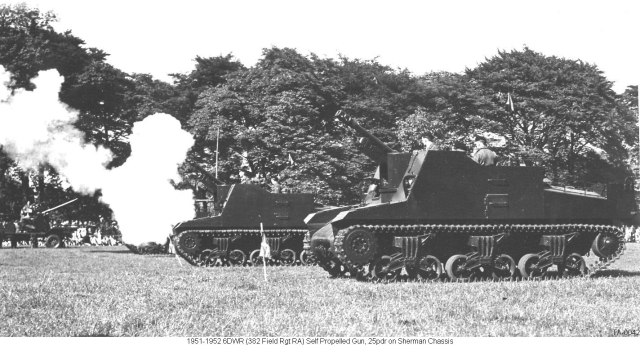 During the war it was trained as a Royal Artillery searchlight unit, earmarked for service with 21st Army Group in Normandy following the invasion, but, in the event, was converted to infantry, and, as 600 Regiment RA (DWR), saw action at the siege of Dunkirk in 1945 as part of the Independent Czech Armoured Brigade. A cadre returned to Huddersfield on 1st June, 1946, when the Regiment went into suspended animation. The soldiers were accorded a civic welcome at the Town Hall and the parade marched with the Colours to the Parish Church. 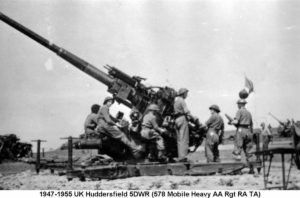 On 1st May, 1947, The Regiment was reformed as 578th (Mobile) HAA Regt RA (5th Duke of Wellington’s) (TA) with RHQ & P Batteries in Huddersfield. 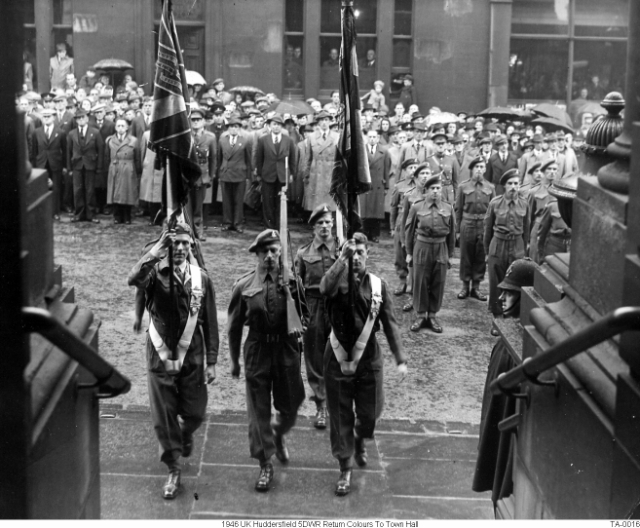 In 1950 the 5th Battalion’s Second World War Memorial was unveiled at the Drill Hall, by General Sir Phillip Christison, Bart, CB DSO MC on 7th October. On 13th September, 1952, the Regiment, with other Battalions of the Duke of Wellington’s Regiment, attended a parade in Huddersfield after the Borough had granted the Duke of Wellington’s Regiment ‘the privilege, honour and distinction of marching through the streets of Huddersfield on all ceremonial occasions with bayonets fixed, Colours flying and Bands playing’. The salute was taken by the Mayor, accompanied by the Colonel of the Regiment, General Sir Philip Christison. In 1955 the unit became Q Battery, 382 Medium Regiment (TA) being converted back to infantry and merging with the 7th Battalion to become 5/7th Battalion (DWR) (WR) (TA), being retitled as the West Riding Battalion in 1961. In 1967 much of the TA was reduced to Cadre strength until 1971 when the cadre at St Pauls Street was increased to company strength, as C (DWR) Company, 3rd Battalion Yorkshire Volunteers. 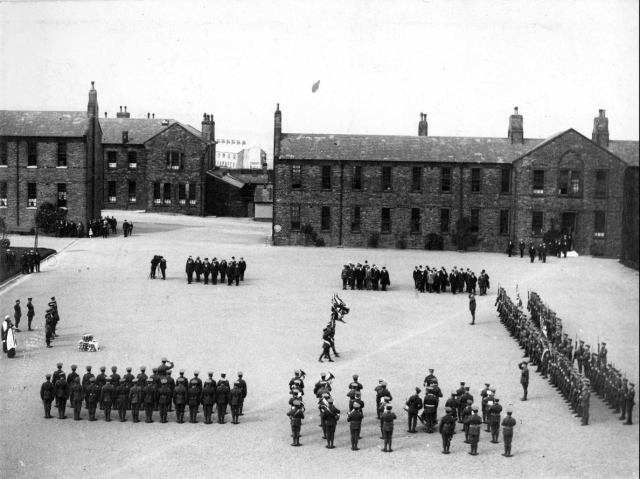 The Drill Hall also became home to the BHQ and HQ Company of the 3rd Battalion. On 4th April 1992, the 3rd and 4th Battalions of the Yorkshire Volunteers were amalgamated and the HQ moved to Sheffield, until a further reorganisation in April 1993 saw the creation of the 3rd Battalion Duke of Wellington’s Regiment (West Riding) (Yorkshire Volunteers). On 1st July 1999, the East and West Riding Regiment was created from the former 3 PWO, 3 DWR and KOYY(LI), the HQ moving to Pontefract. Ypres Company was based at Huddersfield with a detachment in Keighley Drill Hall. On 18th June 2006, the E and WRR merged to form the 4th Battalion The Yorkshire Regiment on the amalgamation of the three remaining regular army Yorkshire regiments into the newly created Yorkshire Regiment. Ypres Company became Corunna Company the Yorkshire Regiment. The title was changed from Territorial Army to Army Reserve in 2014 and the Drill Hall officially became an Army Reserve Centre. Huddersfield Drill Hall, as the spiritual home of the Duke of Wellington’s Regiment since the removal of the title Duke of Wellington’s Regiment from the 3rd Battalion The Yorkshire Regiment in 2010, was the obvious choice of home for various items from the DWR Depot and RHQ Office on the closure of the final building at Wellesley Park in December, 2015. 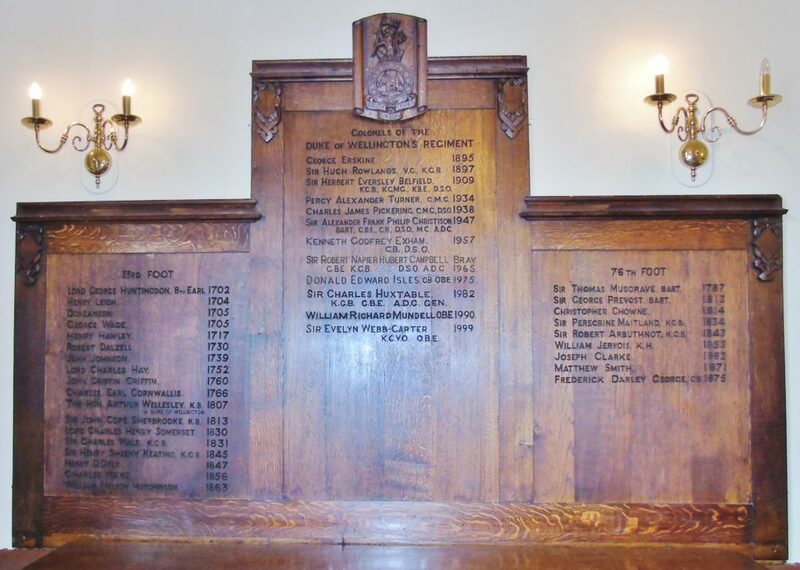 Wooden panelling boards with the names of past Colonels of Regiment, COs and Adjutants, and many other items have been placed in the Drill Hall and Officers’ Mess.